Want to know an easy way to bring a smile to a child’s face? Have Santa send them a personalized letter all the way from the North Pole! 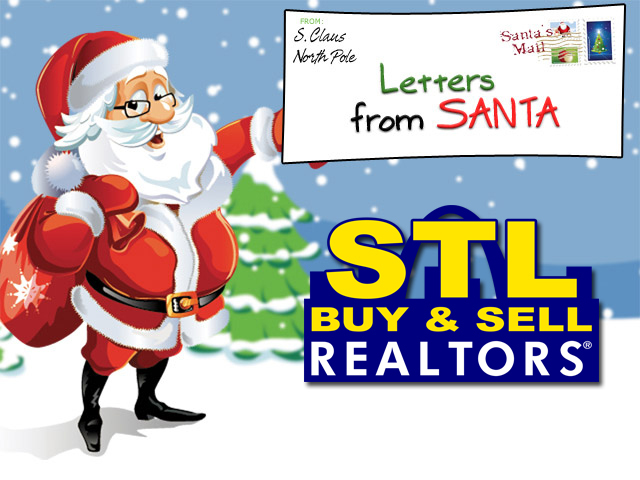 The STL Buy & Sell, REALTORS team of elves has coordinated with Ol’ Saint Nick himself to send letters to good boys and girls. It’s very simple, just fill out the form below and we will take care of the rest. Your loved one will receive a FREE, personalized letter from Santa with an OFFICIAL postmark from the North Pole! Only one letter per child will be accepted, but you may request letters for as many people as you like! (If multiple children are at the same address, Santa will do his best to make sure the letters are different.) Santa also has a special letter for Baby’s First Christmas! Requests must be received by December 10 to receive a North Pole postmark. Be sure to hit SUBMIT when you are finished and we’ll take it from there! Merry Christmas from STL Buy & Sell!